Modern heroine photographer goes to the historical home of Thomas Edison’s lawyer, Jonathan Brisbane. As an inquisitive type person, she decides to sneak behind the roped off area of the third floor even though she has specifically been warned not to do so. On the stairwell, she experiences what seems to be like a wind tunnel. She finds rooms already decorated with historical accuracy and wonders why the area is closed to the historical museum patrons below. While snooping in this area, she is discovered by a man she assumes is playing the part of the Jonathan Brisbane character (a dead ringer for him as stated by all in the modern world who see him). Of course, the wind tunnel traveled her back in time and hero considers her a spy to ferret out the secrets of Thomas Edison’s latest inventions sent by the dreaded competition. Although he considers her a threat and a spy, he clothes her and introduces her to his mother. While snooping through heroine’s things which hero had locked in his safe, he maces himself, although he considers her camera a larger weapon. The mother basically adopts the girl and provides her with a complete wardrobe and throws a party for her to introduce her to all their friends. Mama also invites a medium as party entertainment. It turns out the medium also hales from the future and understands exactly what happened to heroine. Medium also informs hero that his ex-wife, still pretending to be his current wife, is about to arrive on his doorstep within days. Of course, ex-wife could get away with pretending to be hero’s current wife because hero didn't really tell anyone that he divorced way back when. Everyone lets nasty ex-wife come in, take over, boss everyone including servants around like she is still the wife and has some right to control everyone else. 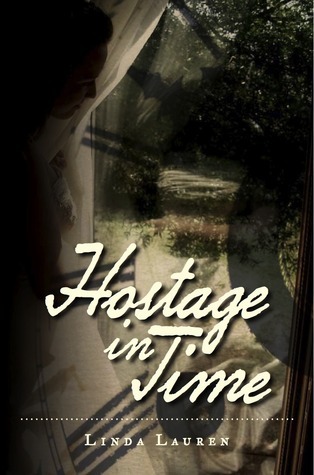 Some conflict happens and heroine photographer is transported back to future and gets followed by Brisbane. A pamphlet from modern times describing Brisbane’s historical home changes as events unfold and the characters finally figure out this is a way to change history according to the way they want things to go. Eventually, the ex-wife is sent on her way and modern photographer and attorney live happily ever after. Overall I enjoyed the story told in Hostage in Time by L. Lauren. I found the story inventive when the main characters figure out they can find the results of their machinations by reading a museum pamphlet so they can adjust their actions according to what they want the end results to be. I found it humorous, if a bit predictable, when the hero sprays himself with the heroine’s mace and thinks she can kill him with her camera. However I found myself disappointed as well. When our heroine traveled to the past and was accused as a spy by the hero, the story quickly veered into unbelievability when the hero almost immediately turned around and supplied the spy with time period clothing and a guest room in order to properly meet his mother with whom he resided. His mother practically adopts the stranger to their home and he complies with mom’s wishes. The hero is a grown man and an attorney, he believes the heroine is a spy and a thief, yet introduces her to his mother, has her for dinner and gives her free run of the household before then buying her a complete time period wardrobe while his mother throws a welcome party for her. All I can say is that certain aspects of this tale are just too unbelievable. Rated PG-13 for sexual activity.